Compared with yesterday's weather, today is paradise. The sun is back, and the temperatures are moderate. The humidity is higher than I'd like, but completely bearable. I rested yesterday and was more than ready to get out for a run this morning. I tested Chocolate #9 energy gel earlier in the week with good results. It seemed to deliver on its promise of preventing sugar highs or lows and I will definitely pick up a few more, next time I'm at REI. This morning I tried another brand called Accel Gel from Pacific Health Labs that claims to provide rapid energy to muscles using a (patented) formula with a 4:1 ratio of carbs to protein. Almost everything I've read about effective energy supplements supports an ideal mixture of simple and complex carbs, along with amino acids and, occasionally, caffeine. Protein is usually relegated to post workout recovery, since it doesn't convert easily to glycogen. The Accel Gel website states that the protein in the mix is helpful for both endurance and muscle recovery. I took an Accel Gel (vanilla flavor) about 15 minutes prior to my run, with water. The gel wasn't thick like GU. It felt and tasted more like sweetened vanilla extract syrup. Gels aren't intended to be consumed as snacks. If they were, I'm guessing few people would choose this brand. I'm not saying it was bad, but I didn't love the taste. 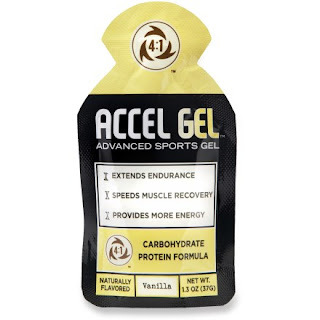 Like the Chocolate #9 gel, this Accel Gel helped get me through the initial minutes of my run with good energy. 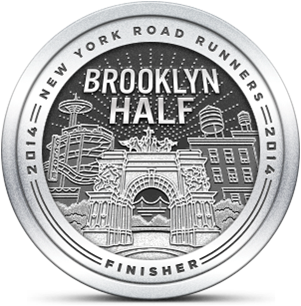 I wondered whether this feeling would reverse itself later, after a few miles of depletion. I think there may be something to the endurance claim, because I didn't feel run down after 50 minutes of running in the sun, heat and humidity. Running is as much about your head as your body, and today, my head felt a bit tired. Interestingly, my body was ready to work, and I managed to move along well despite feeling like I was pushing too hard. Was it the gel that kept me going? Hard to know. But I had a pleasant 5.5 mile run and, even with the humidity, I didn't come close to a bonk. As with Chocolate #9, more testing of Accel Gel is required. However, I was pleased what I've experienced today. GU Roctane is still my go-to gel during races, but it's always nice to have other options.